The group appears in a wide variety of settings, from world-famous concert halls, such as the Berlin Philharmonie and Carnegie Hall, to state fairgrounds and high school gymnasiums. 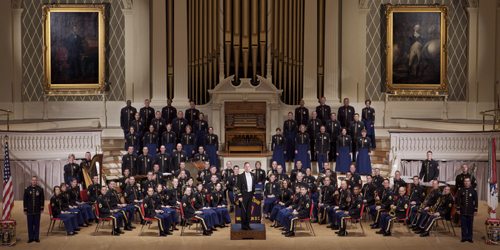 The Concert Band regularly travels and performs with the Soldiers’ Chorus, together presenting a powerful and diverse program of marches, overtures, popular music, patriotic selections, and instrumental and vocal solos. The organization has also performed joint concerts with many of the nation’s leading orchestras, including the Boston Pops, Cincinnati Pops, and Detroit Symphony Orchestra. In addition to formal programs, the Concert Band has participated in numerous presidential inaugural parades and supported many diplomatic missions overseas. Regardless of the venue, the pageantry and professionalism of the band’s performance is sure to be entertaining and emotional for all audiences, instilling pride in our American heritage.